We should have 5 in stock. Need more? It usually takes us 7 - 10 days to bring more in. We call this a coffin lock but it is also known as a roto lock. 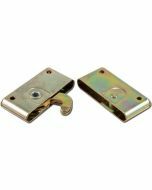 Commonly used to lock scenery pieces or platforms together and has a wide variety of other uses. Heavy duty metallic construction and uses an industry standard 5/16" Hex Key to operate. For side or concealed mounting. 0.7" x 3" x 3.4"